Who took all the Satanic Prayer Line cards from Caffe vita in Olympia just now? Who ever you are, Satan is in your heart. We hope you'll use them to share the dark gospel with others. We hope you didn't just remove them to keep our message from others. This morning at The Evergreen State College we caught a woman removing flyers promoting the June 27 gathering. When confronted, she said she was triggered by them because she is a victim of Satanic Ritual Abuse. We do not promote abuse, and are not convinced by unsubstantiated claims of satanic ritual abuse. But as many of us are victims of Christian ritual abuse, we are sympathetic to people who believed they have suffered abuse in the name of a religion. We will continue to post our flyers, because we see no purpose that can be served in being silenced by fear. We are Satanists who have never abused anyone. We are proud to be Satanists and will not be silenced by modern witch-hunters. If you were abused by Jews, would you be justified in purging public spaces of Jewish flyers? No, you would rightly be called a hateful bigot by anyone who saw you doing such a thing. To everyone removing our flyers: Your traumatic past does not excuse hateful bigotry. We do not try to silence you. Why do you wish to silence us? Is it our very existence you find objectionable? We are here. We are proud to be what we are . We refuse to be silent and closeted any longer. We are Satanists! The monthly gathering of Olympia Satanists will arrive on schedule. As usual, there will be cookies, but no vegan cookies unless someone else brings them. The Anti-Chris will demonstrate the Satanic Oracle he is developing. Come and be amazed and demystified! What dark secrets will be revealed? We'll talk about Satan and our various left-handed paths through life. Is it as sinister as it sounds? There's only one way to find out. We don't know anything about this band, but they seem to like our flyers. So they must be worth a listen. Please go to their show and support our fellow minions of the infernal disorder. 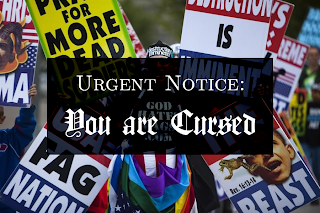 Please join us in praying to Satan for the Westboro Baptist Church and cursing them on their upcoming visit to Seattle and Olympia. We will be at the State Capitol to meet them, and possibly one of the other locations and times (we have to choose only one due to transportation issues). While the hateful Westboro church has no problem harassing high-school students, we think that showing up at a high school with our own religious message is going too far. But we certainly encourage Satanic high-school students to pray to Satan for these people on their own in a visible way. For background, the Westboro Baptist Church is the group that has disrupted military funerals, claiming that the deaths are god's punishment for our tolerance of decadence and homosexuality. Since everyone else has been praying to their gods for these hateful people to change their ways with no results, maybe a few Satanic curses will help to set at least a few of them on a different path.